The Real CBD - Full spectrum CBD oil, all the cannabinoids. Full-spectrum CBD oil refers to pure hemp oil that has all the same cannabinoids, also present in the original hemp plant. 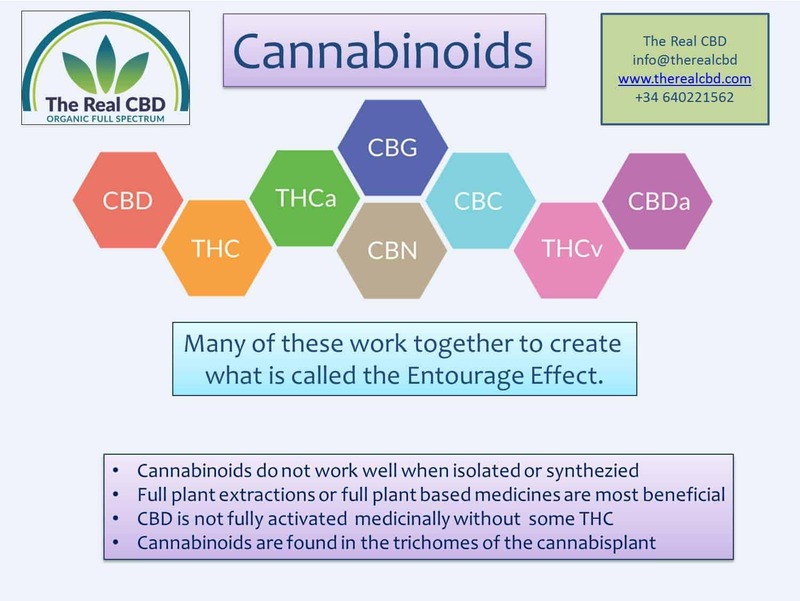 This providing a CBD oil supplement that allows the cannabinoids to work together in what is called the entourage effect. However, it isn’t just the cannabinoids that make our CBD oil a valuable addition to your complete diet. The oil also contains many essential vitamins and minerals, fatty acids, fiber, protein, chlorophyll, flavonoids, and terpenes. The health benefits of full-spectrum CBD oil go beyond it being a source of CBD. The array of cannabinoids found in full-spectrum hemp oil have been shown in studies to work together. This is called the “entourage effect.” Together, these compounds work harmoniously to magnify their therapeutic properties. The mix of cannabinoids, essential nutrients, protein, and healthy fats work together to encourage balance in our health. Many other CBD products are made up of CBD crystals or isolate. This means CBD has been extracted away from everything else the whole plant has to offer. “Whole plant Medicine” is a term used to describe medicines utilizing the full spectrum of compounds hemp has to offer. These therapeutic agents that are processed out of THC- and CBD-only products, have so much to offer patients.